Protect your Magento backend against unauthorized logins and fraudsters today! Because passwords just aren't secure enough. Fearing someone could log into your Magento store to download all your orders, customers and other sensitive data? Fearing hackers and the consequences after getting hacked? Fear no more! Using the Two-Factor Authentication extension by XTENTO, additional security information will be required when logging into the Magento backend. Besides the username and the password, a so called security code (a one-time password, OTP) will be required to log in. The security code gets generated by your smartphone (the second factor). Each security code can be used once only and is valid for 30 seconds only. Hackers won't be able to log in without access to your smartphone. Just turn on your smartphone - open the Authenticator application - and you'll immediately see the security code required to log in, valid for the next 30 seconds only. It's really easy, but the increase in security is immense. As long as you've got your phone, this will ensure only YOU are able to login, and nobody else. No other person is able to generate the security code as it's generated using a unique secret key only known to your phone. You can't log in if you don't have the security code. You can't log in if you don't have the password. You always need the password and the security code to log in. 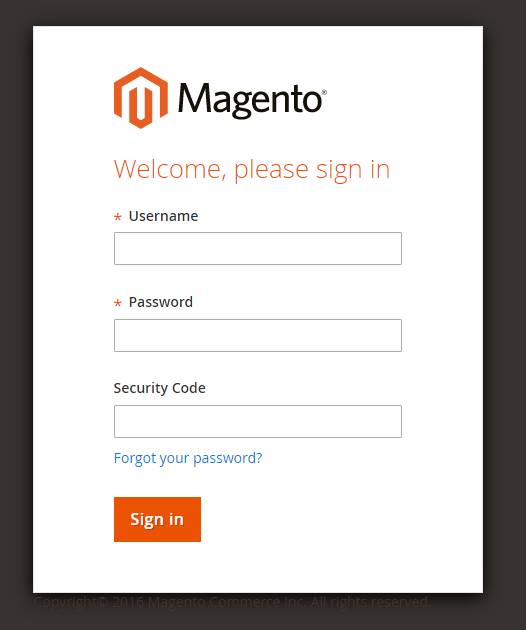 This makes it almost impossible for hackers to log into your Magento backend. 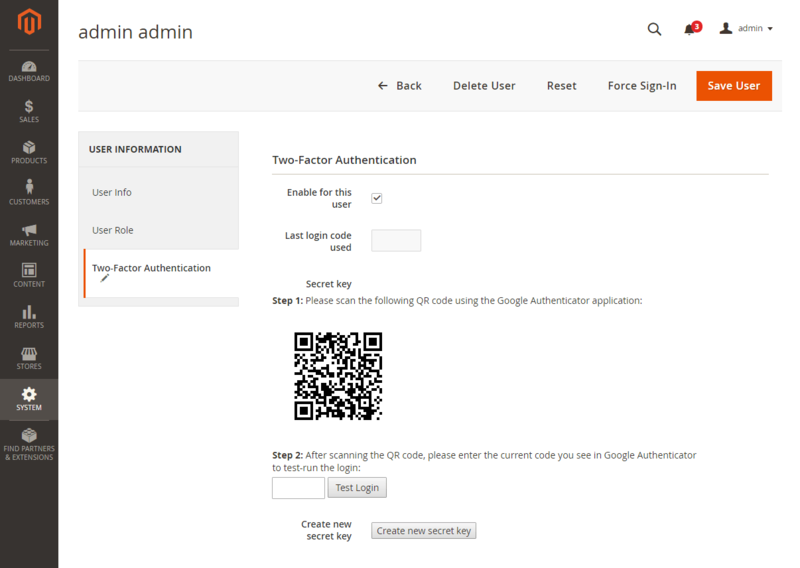 Setting up Two-Factor Authentication for an adminstrator in Magento is easy: Just go to the Users section in the Magento backend, click Create secret key and scan the barcode using the Authenticator application (on the phone of that user). That's it! Your account is now protected against unauthorized logins. Get the Two-Factor Authentication extension now to protect against today's threats without the hassle and cost of yesterday's technology. New feature! Disable Two-Factor Authentication for known IP addresses: Simply enter the IP addresses you don't want to use Two-Factor Authentication for in the Magento admin. This especially makes sense if you've got a static IP address and don't want to enter your secret key when logging in from a known and trustworthy IP address. This extension is compatible with recent iPhone, iPad, iPod touch, Android and BlackBerry smartphones. The extension uses the free open-source Google Authenticator application to generate the security code required to log in. The Magento Two-Factor Authentication extension is also compatible with Authy, Duo Mobile, Lastpass Authenticator and Yubico Authenticator. Before your purchase, please make sure your device is able to run the Authenticator application. The secret key will only be saved on your smartphone. Neither XTENTO nor Google will be able to recover it. The magic all happens on your device. If you ever lose your smartphone, be sure to create a new key in the Two-Factor Authentication section under 'Users' in Magento so no one is able to log in using your smartphone. This extension does not guarantee a 100% protection against hackers. If someone hacks your FTP server, they will be able to disable the security code login, but if that ever happens, they'd be able to download your database anyways without Magento backend access. For merchants affected by the Google Charts API deprecation: This extension generates the QR code to set up TFA using your smartphone without using the deprecated Google Charts API. It instead generates it locally, in your browser, which is much more secure. Setting up Two-Factor Authentication for an admin is easy. Just scan the QR code in one of the supported Two-Factor Authentication applications, on the admins phone, and test & enable Two-Factor Authentication for their account. Xtento has very professional extensions for Magento. We have 3 of their extensions, and we have had not issues with any of them. They just all work. Would highly recommend! This extension does not rewrite any classes. * Fixed an issue where the "TFA not required for certain IP" feature didn't work if the server is behind a reverse/caching proxy. * Fixed adminhtml controller that didn't work in some environments and led to "code is wrong" always when attempting to enable TFA.